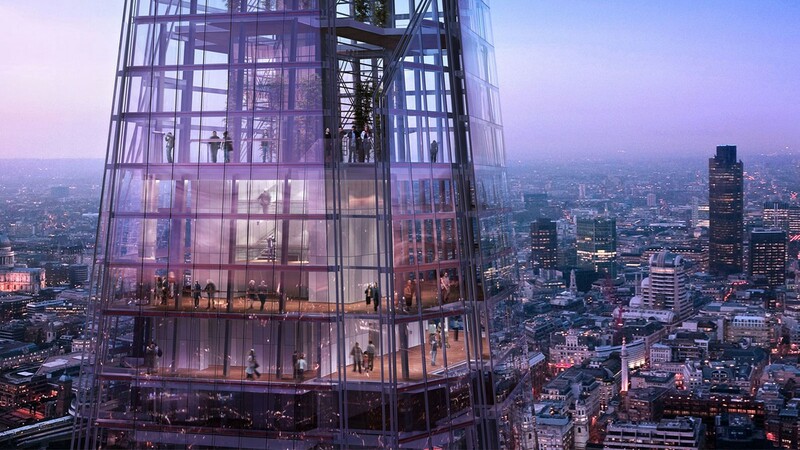 Rising 309.6 metres above London, with 11,000 glass panels, The Shard, which officially opened on February 2013, is officially the tallest building in the European Union. It certainly does look like a giant shard of glass in the heart of the city. 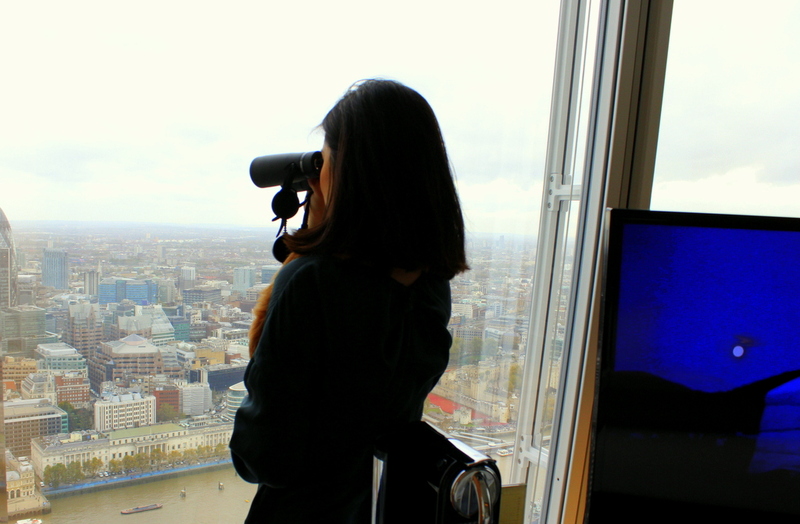 To get a view like this, you can visit the observatory during the day (levels 68 -72) . 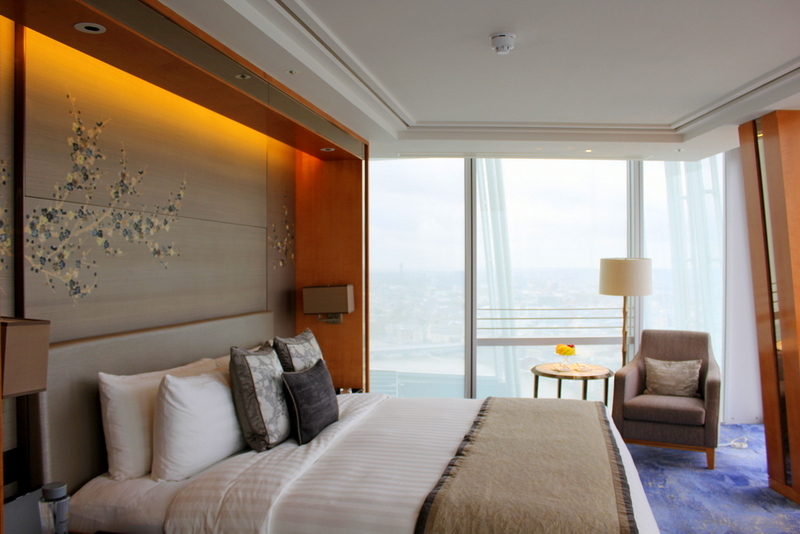 Or you can stay at Shangri-la Hotel at The Shard , and wake up and sleep to this magnificent view of London. A very quick walk from Borough Markets (2-3 minutes). 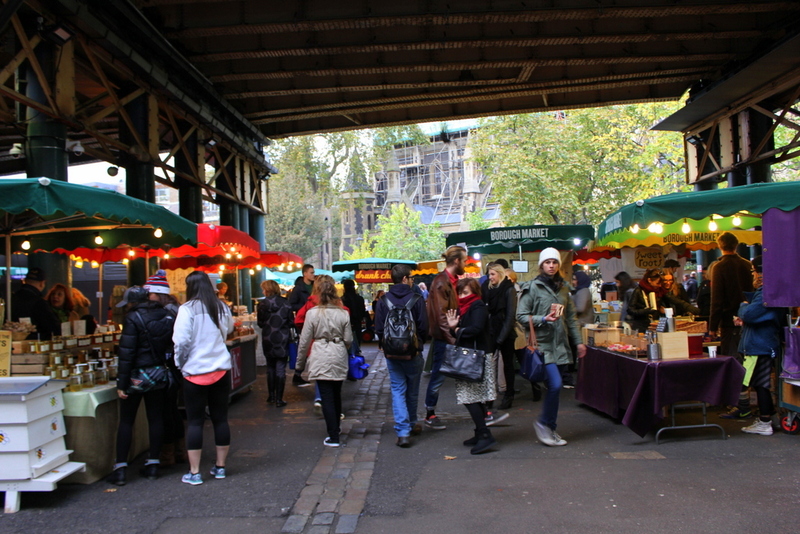 It was quite nice to take a leisurely stroll to the markets, where I enjoyed a steaming hot Ethiopian meal. 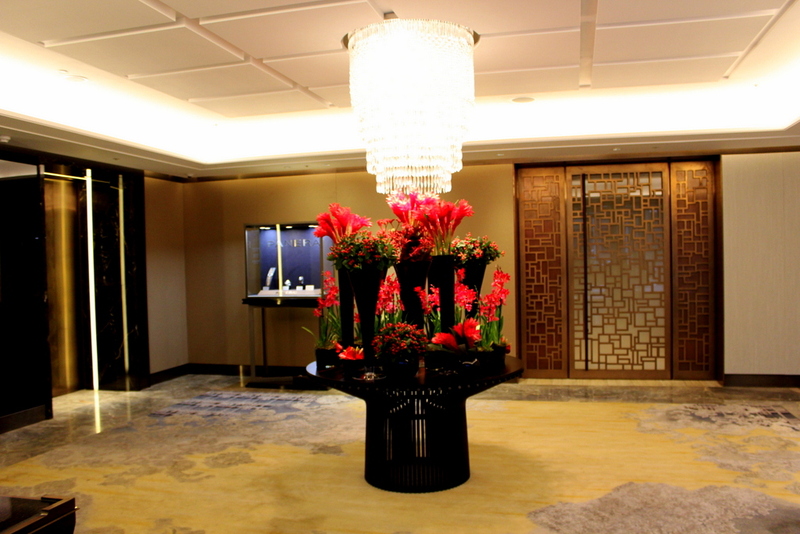 The nearest station is London Bridge, which is just 2 minutes’ walk from Shangri-la. Shangri-la has 2 receptions in the building. One on the ground floor, where all guests’ bags are x-rayed before you can head up. Some may be bothered by this, but the Shangri-la is just complying with The Shard’s security standards. I myself find this reassuring. And the fact that the security staff who handle the x-rays are very cordial and warm somehow makes this extra step pleasant and ‘bearable’. It’s the signature Shangri-la touch and style with lots of subtle gold accents. The lifts (elevators), as you may imagine are high speed and modern. 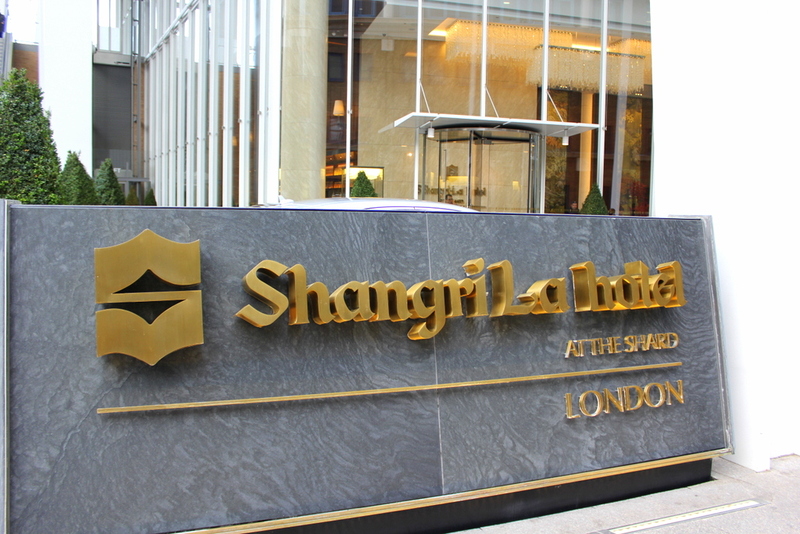 Shangr-la Hotel occupies levels 34 – 52. Level 35 is the second, and bigger reception. And soon as the lift doors opened, these views greeted us. 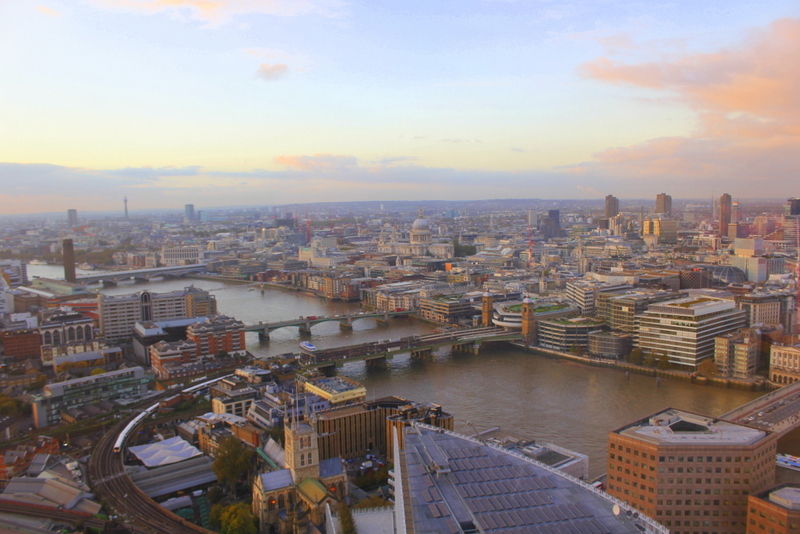 It was just in time for sunset so it was a lovely shade of Londontown that I saw. Due to the structure of the building, you need to take a separate lift to proceed to the rooms. Our room was on the 49th floor, an Iconic City View Room, The a Iconic view rooms have floor to ceiling glass windows on the side and front of the room. Clean, spacious, natural light thanks to the view..Oh THE VIEW. 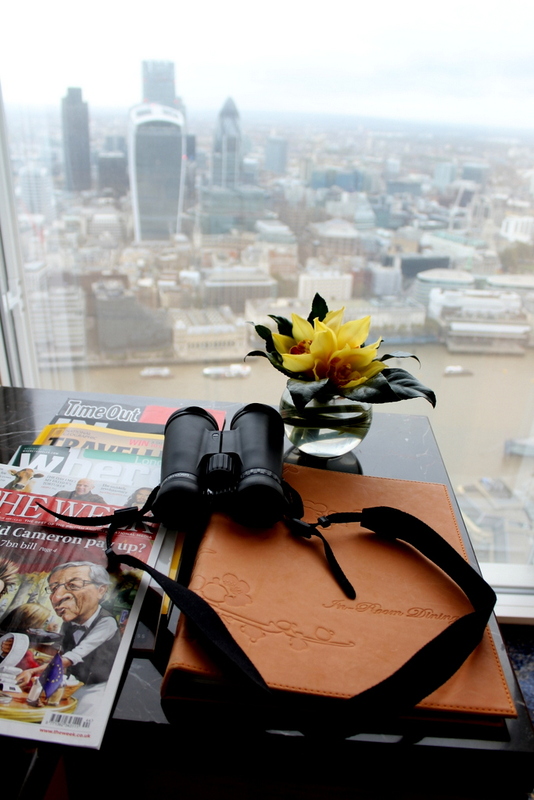 The views at the Shangri-la at The Shard are its selling point, and yes, they are very much worth it. The room is equipped with binoculars and I spent almost an Hour playing I spy with my eye binoculars. The River Thames was right in front, along with the Gherkin, Tower Bridge (and all other bridges). For a London-phile like me this was pure paradise. I could see people walking along the bridge, City cruise boats going up and down the Thames and best of all, the train line – which from 49 floors up looks like a small caterpillar chug-a-chugging. 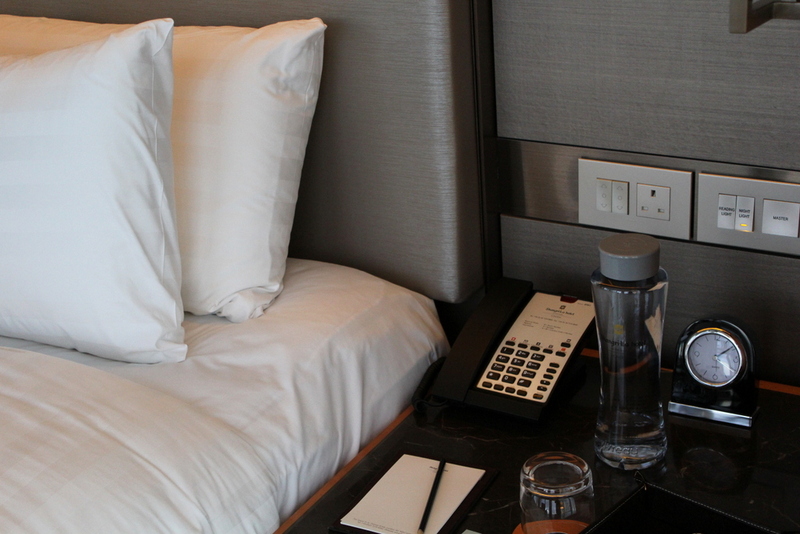 The bed was delightfully firm, and the pillows very dense and robust, with just enough fluff. If I can custom make my personal bed and pillows into any way I can — I would request it to be The Shangri-la style. So far all Shangri-la hotels I’ve stayed at hasn’t failed in giving me the best sleeps of my travelling life. The other thing I’m loving is the size of water bottles in the room! Yes most hotels nowadays provide water bottles, but believe me, there are some who give those teeny one-swig bottle that look toddler and baby-sized. Always my most favourite part of any hotel room. Loo with a view. A separate shower and bath. Though not overly spacious, the size is generous and provides a good dressing area. The sink / mirror is my favourite part. 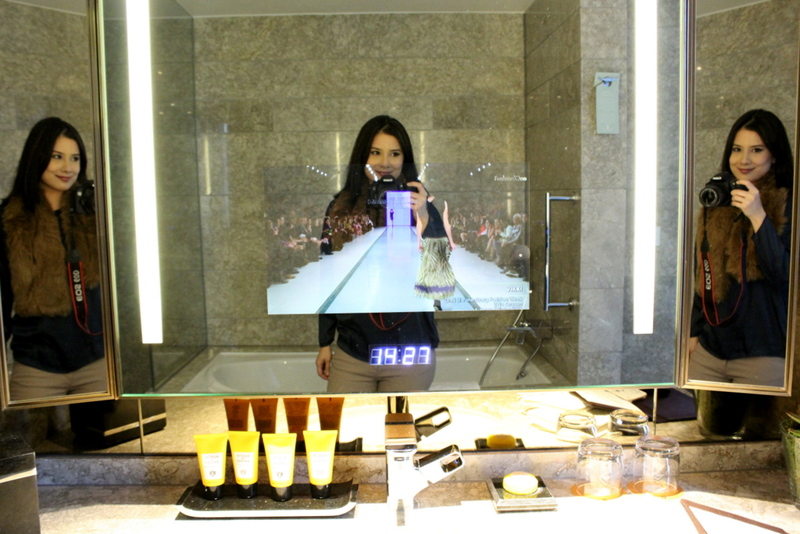 It has a built in TV with a digital clock – which is so important for me as I tend to lose track of time inside bathrooms! And most of all, the mirror has three angles – Perfect for checking any kinks in your outfit or hair. The floor to ceiling glass panel in front of the loo also has automatic shades that go down at the press of a button. 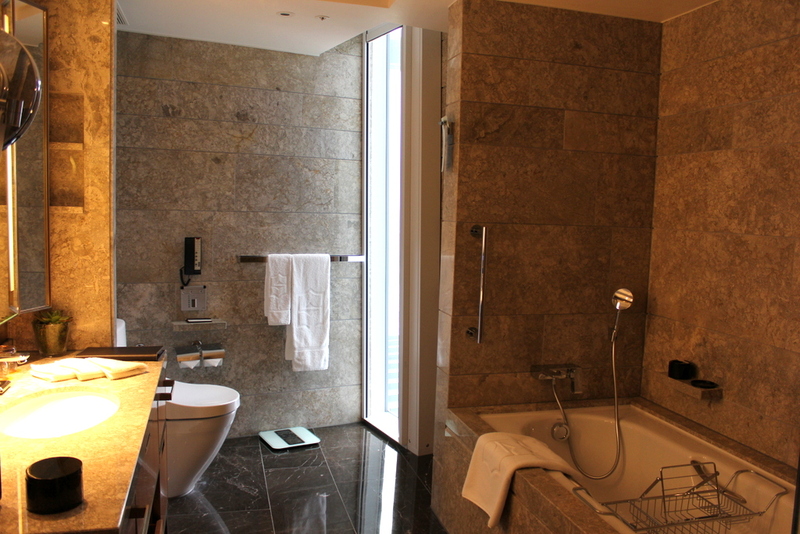 Some rooms at the Shangri-la at the Shard have entire bathrooms with a view – those whose bath tubs overlook the city (kind of like in the room). And this is where things got a little..interesting one evening. Due to the shape of the building itself , there are some glass panels that jut out of the building for structure support and design. 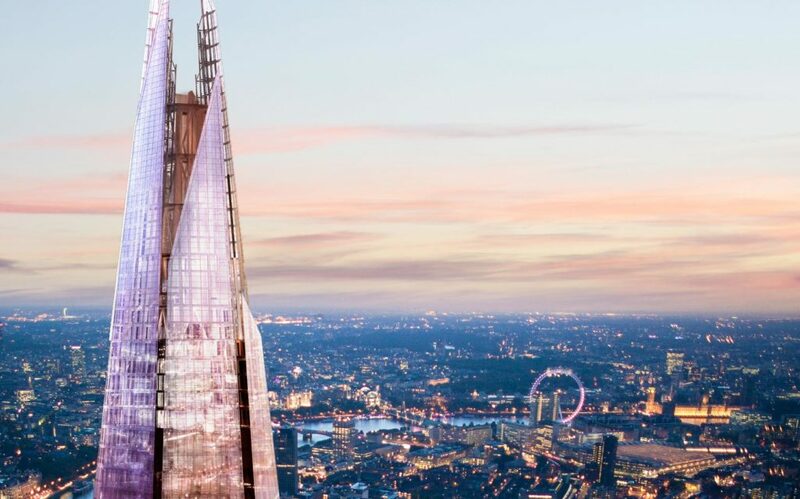 Here’s a bit of zoomed in photo of The Shard (taken from The Shard’s website), just so you get a bit of an idea of what I am about to say. I was about to nod off one evening, and I of course had all the window shades up to enjoy the view of London at night , which is one of the best I’ve seen. Out of the corner of my eye, I saw a human figure moving in the window. My heart stopped. Surely that can’t be a window cleaner at 1130 PM?? When my eyes focused abit more, I realised that it was the reflection of a guest washing her face vigorously in a room about 1 or 2 levels below mine. And it was a clear reflection (not a hazy one). I’m so glad that the upper torso was covered by another glass so I at least won’t be able to recognise the guest at breakfast the next day or so. I was transfixed for abit because after washing her face, she must have washed her hands at least 7 times. Like a complete wash, lather , rinse, dry repeat cycle kind. It reminded me abit of Jack Nicholson’s character in As Good As it Gets. 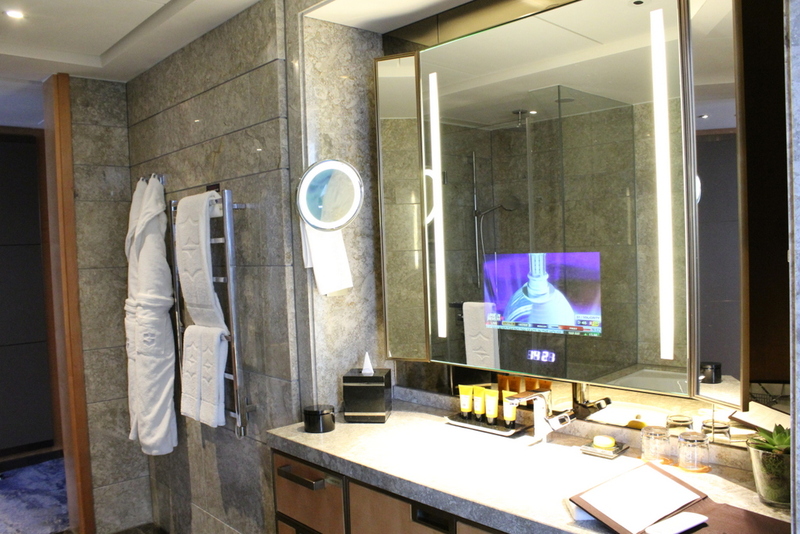 So this guest was booked in a room whose bathroom had views overlooking the city. I stayed abit late reading articles about this. Shangri-la apparently knows about the design quirk and they do inform guests who are checked in such rooms (bathrooms overlooking the city) to draw the shades when using the bathroom. So I slept that night assured that at least the guest intentionally did not care that she can be seen! 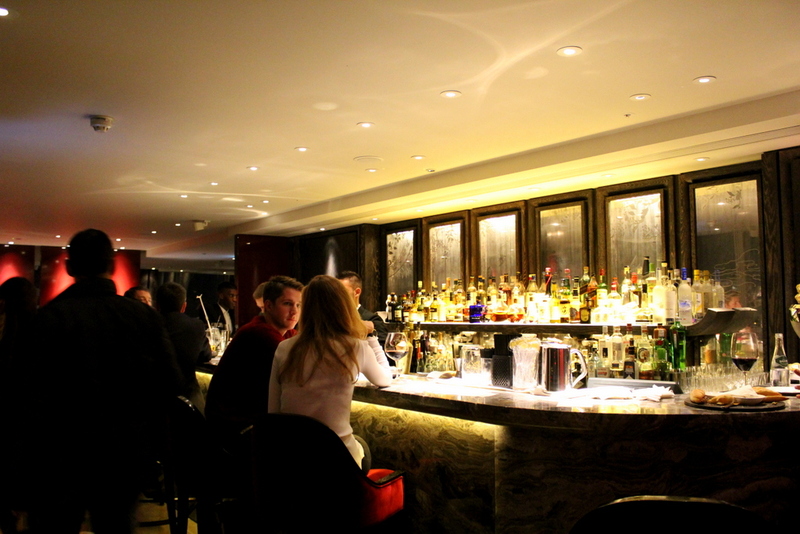 GONG bar at Level 52 is London’s highest bar. We enjoyed drinks here prior to dinner. As the evening got later, the bar became busier and it’s clear that this is a hip and popular choice for after work drinks for locals. 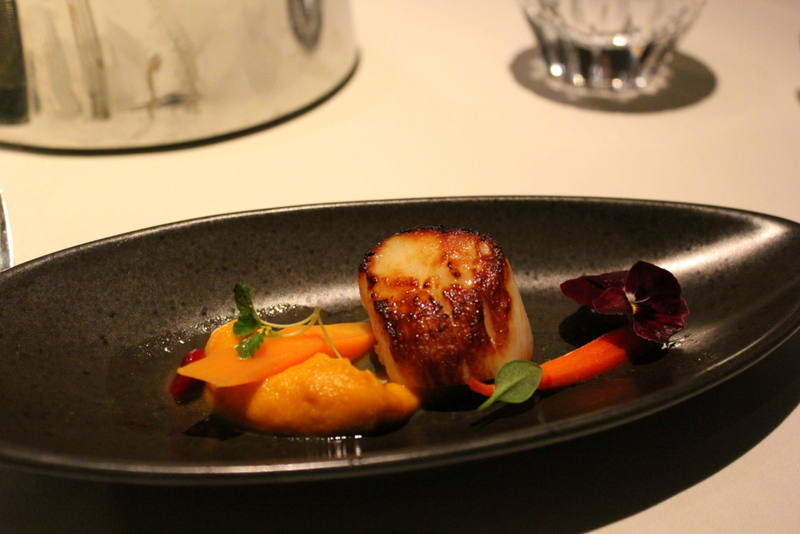 TING Restaurant at level 35 offers a European menu with a subtle Asian influence. We had dinner here after drinks and it really is a great place to dine while enjoying the view. It so happened that it was Guy Fawkes Night when we were dining so we could see fireworks all over the city. These were crab flakes with mango, cucumber and passionfruit. 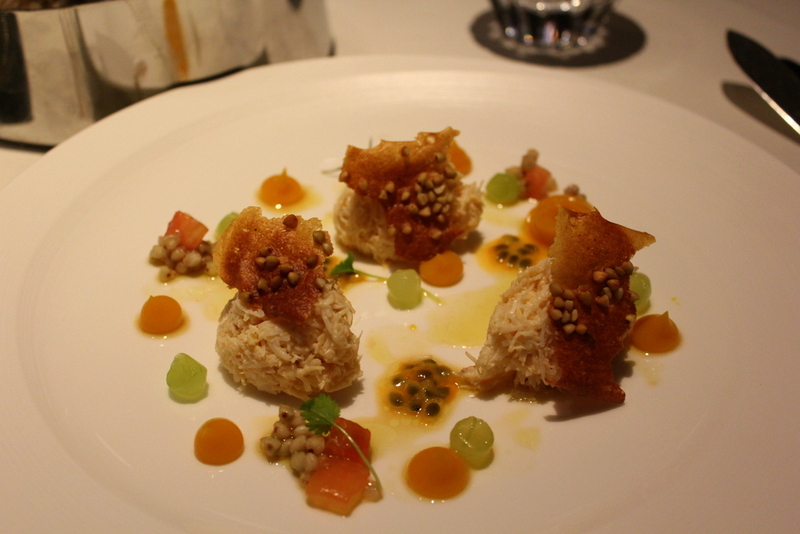 It’s refreshing , the light sea-saltiness of the crab meat complementing the tartiness and mild sweetness of the fruits. When our waiter found out that I love seafood, this second entree soon arrived. He said it was a special treat from the kitchen. Ok, I don’t think there’s a way to photograph anything with froth and make it look appetizing. 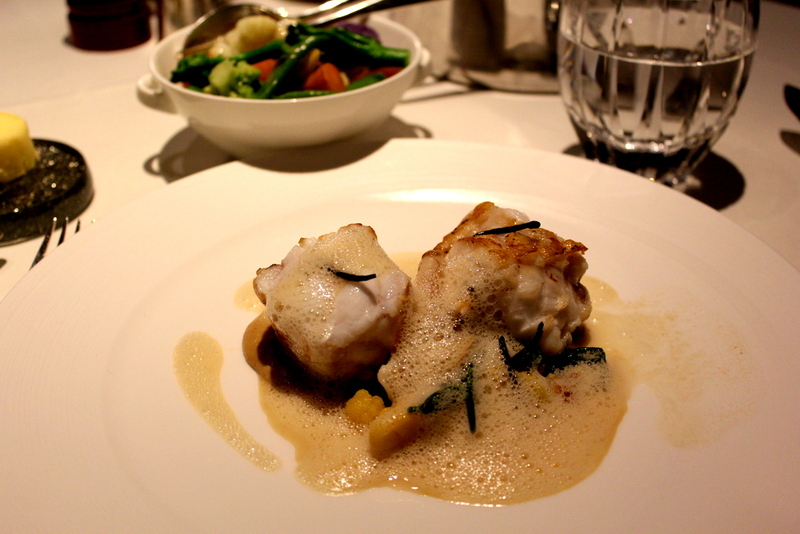 But this monkfish with miso froth was seriously good. 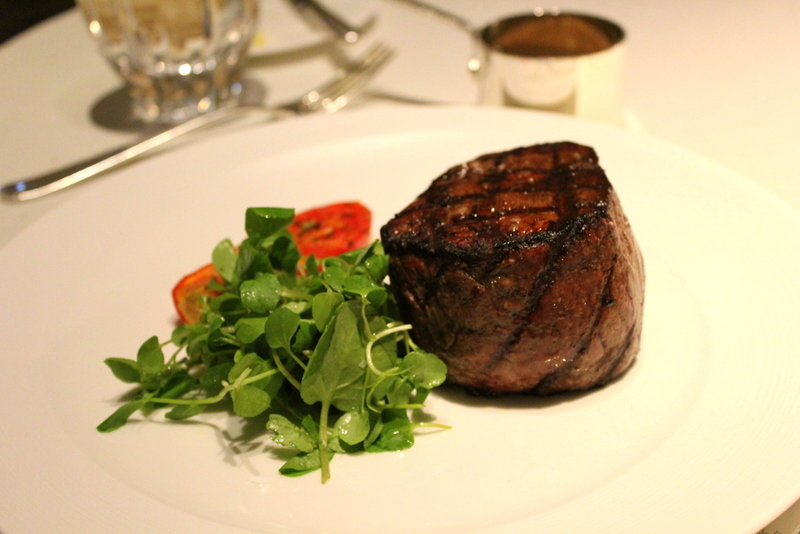 The meat was firm and tender, and paired with the steamed vegetables on the side it was a seafood lover’s dream dinner. This was a set menu dinner and I lucked out on the wonderful seafood choices! Those were exactly what I would pick on the menu. British Beef Fillet which I had one bite of, and it was perfectly smokey and tender – a great claim for a ‘once -in -a-while’ or ‘only-if-there’s-no-other-choice’ beef eater like me. 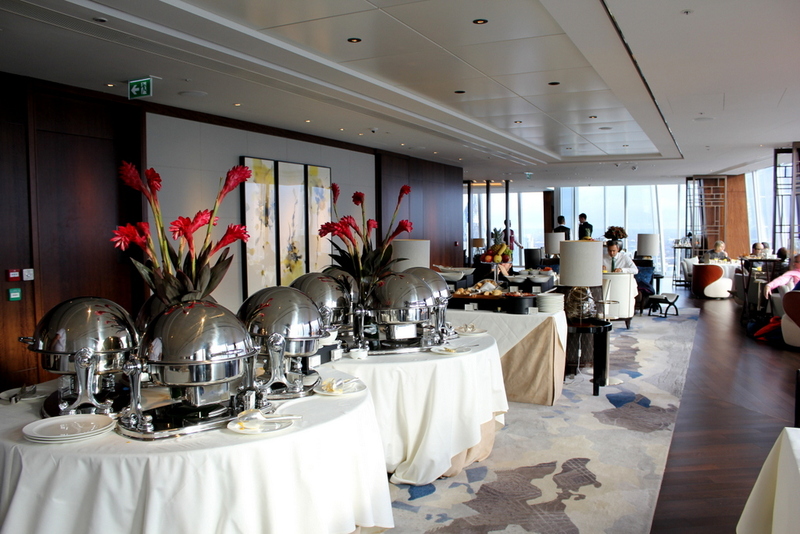 In the mornings, TING restaurant is venue for breakfast with a view. 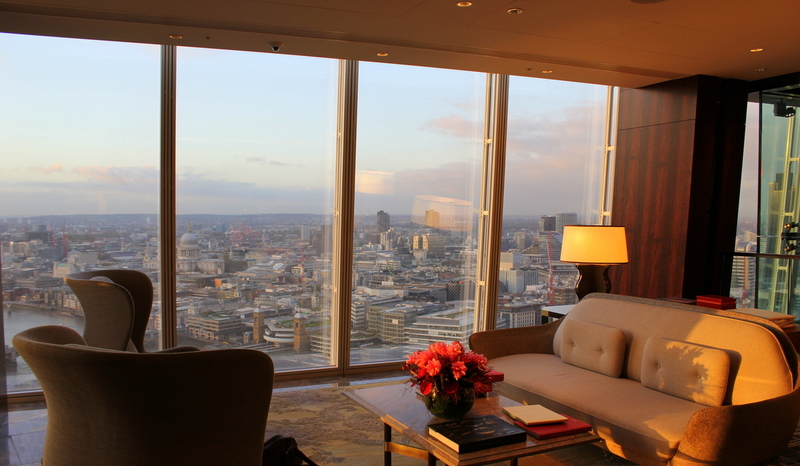 I was very impressed with my stay at Shangri-la at The Shard. Everything is new, and everything works. The main selling point of the views are just spectacular. 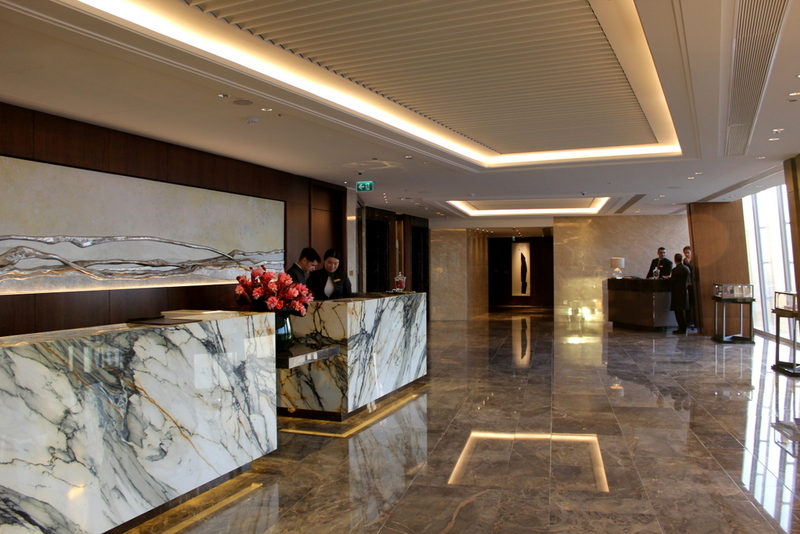 I was quite aware of the mixed reviews (from Trip Advisor and such) during the first few months of operations of Shangri-la at The Shard and I can tell these have been addressed (service- based mostly). The staff from TING Restaurant are notably warm and engaging, most especially our waiter from Italy. Wi-Fi connection is probably the best I’ve had in a hotel. No need to sign up, no registration (last name/room number) of any sort. The moment you enter the lobby you connect to Shangri-la’s network and that is it. Pretty seamless and fast connection. The one thing to be aware of is , on check-out, it took quite a while for our bags to be brought down (mainly due to there being only 2 lifts, plus that you have to switch elevators on level 35) so do allot extra time if you have an appointment after check-out. 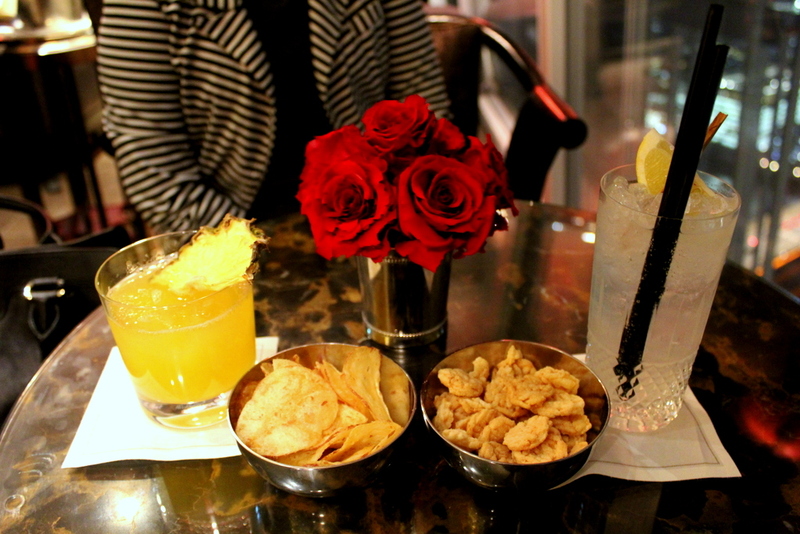 We were guests of Shangri-la at The Shard, but this has not influenced my thoughts and views. ALL opinions of this review are mine. Very beautiful hotel. Love it! Hi Tony, yes I know there’s so much more in the UK that I need to explore! Thanks so much for following me on the journeys. The Pinatubo trek is definitely one of my most memorable! After reading your review and other reviews, I booked a room for several nights. Your review was accurate but with one significant exception….weddings. The hotel uses its lobby as a wedding hall. So from 3pm to 11pm on the first night, we heard techno beat music in the lobby (impossible to talk) and in our room. My review is according mixed. Interesting hotel, but not good for business travel. Hi Wekania thanks so much for the feedback! 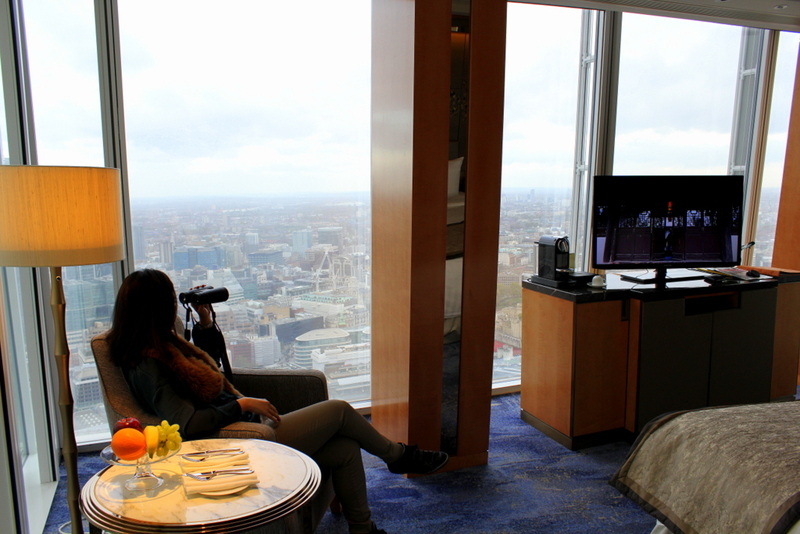 There were no weddings or events in the 2 nights I stayed at the Shangri-la at the Shard London so I unfortunately couldn’t have known that. Sorry to hear about the noise, I assume the hotel was fully booked to have transferred you to a different room / floor? Hi, yes that night shot was an actual photo taken from my camera during the stay. 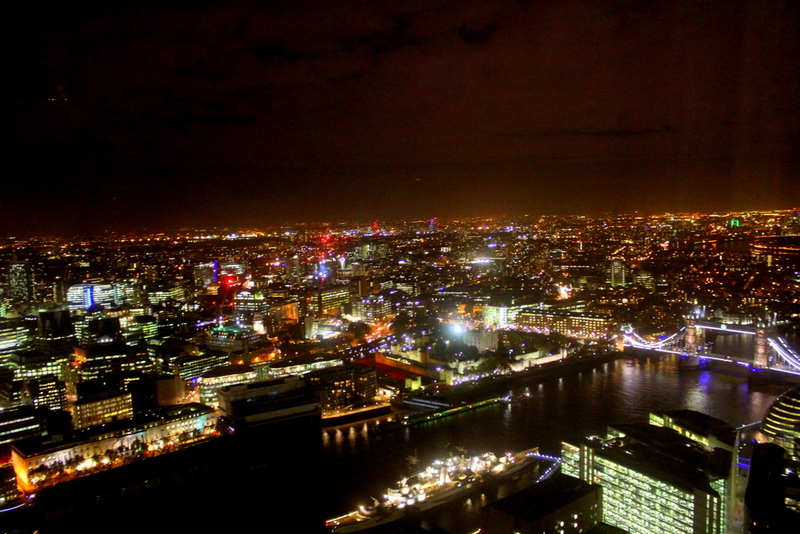 New York vs London skyline at night – different cities, different landscape, you cannot match / compare.